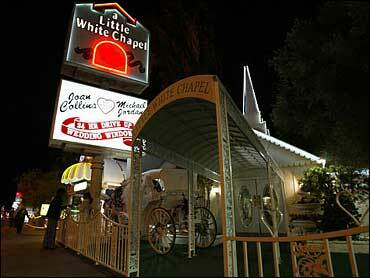 Spontaneous lovebirds and celebrities take note: there won't be any more early morning quickie marriages in Vegas. After years of sanctioning hastily made matches, the Las Vegas marriage bureau plans to close its all-night counter. County officials approved a new 8 a.m. to midnight schedule that will take effect next Wednesday, eliminating 24-hour marriage license service on Fridays, Saturday and holidays. The counter did not offer after-midnight service Monday through Thursday. Officials said the move would affect less than 4 percent of the licenses issued by the bureau and save $200,000 a year. But the cost-cutting move could jeopardize Las Vegas' self-proclaimed standing as the marriage capital of the world, although it could also save the rich and spontaneous from some high-profile grief. Pop star Britney Spears, socialite Nicky Hilton, and actors Demi Moore and Bruce Willis all wed in the late-night hours in Las Vegas. All three unions ended in divorce, with Spears' January 2004 nuptial to childhood pal Jason Allen Alexander being annulled just 55 hours later. Charlotte Richards, whose 24-hour Little White Wedding Chapel married Spears, said despite the spotty track record she was saddened by the change. Richards said she marries 10 to 20 couples after midnight on a typical weekend. She provides a stretch limo to shuttle the betrothed back and forth to the courthouse to obtain a license for the ceremony. She said pre-dawn weddings are popular among members of the military, lovers driving in from Southern California and celebrities. "All the stars come out at night," Richards said. "People that are high profile, when they come down to Las Vegas to get married, they don't want to come in the middle of the day when people are around. They like the privacy." County officials, who issued 122,259 licenses last year, said the new schedule won't prevent holy matrimony after midnight, but will just force a little planning to obtain a license in advance. "They just can't run down to the bureau at 3:05 and be married by 3:10. They have to give just a little thought to the process," county clerk Shirley Parraguirre said.